When the leaves start to turn colors, it’s time to think about how ready you are for the late fall and winter. Of course that means raking the yard and getting decorations for the holidays, but there are plenty of other tasks which are needed to make sure you’ll have a warm and cozy season. One of the most important appliances in your house will be the furnace. Gas or electric, it’s vital to get it inspected to make sure everything’s working well. You might know how to check and light the pilot light on your own, or even change the furnace filter, but you want an expert to take a look at the belts, motors, and everything else to be sure you’re in good shape. It’s not a bad idea to run the furnace once or twice before you get someone out, so you can tell if you hear squeaks or whines when it starts—indicating the need for new belts—whether the air feels all that warm, or if the thermostat seems o recognize the proper temperatures. The pros can also make sure you’re within safe levels for carbon monoxide or know whether you should cover the AC unit outside. As long as you’re calling inspectors, might as well find someone to check your chimney and hearth. There might be buildup of creosote in the walls, or birds nesting in there, or blockages in the flue that you’ll want to deal with. They should also go onto your roof and make sure there aren’t leaks into the chimney. Walk around your house without any air conditioning and heating going, especially on a windy day, and see if you can feel drafts. Take a close look at windowsills, window jambs, and doors. Rubber weather seals can wear away or be damaged with use, and are easy enough to replace. Sometimes you’ll want to caulk around windows, make sure storm windows are shut, and consider weather you’ll want to use plastic window insulation. Even a modest attempt to reduce leaks can help your energy bills. While you’re outside, might as well put your garden to bed and get your lawn ready. Wait until the first frost to work on the perennials, trees, shrubs, and the like. Pull the annuals and weeds, and if you’re going to compost, start the bins now. Fertilize your lawn and put down seed if you need it, and plant bulbs for the spring. Cover the beds if necessary. After you work on the lawn, make sure to clean your tools. Put away the gardening implements, drain lawn mowers and anything else that runs on gasoline, and clean them before you store them. Turn off all the outside plumbing and put away either the houses or make sure all the irrigation tubing is sealed up. Get up on the ladder and make sure there are no holes, leaks, or weak spots in your roof. See if there are any tree branches that overhang and cut them back so they don’t come down in a storm. While you’re on the ladder, clean up the gutters. You especially don’t want blockages that will turn into dams in ice and snow. Nothing like a flood of freezing water spilling down the side of your house to remind you to work on these chores. Look for small cracks that will expand during hard freezes, and patch them up if you can. 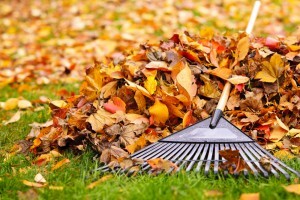 As you’re doing this, check drainage from gutters or across the lawn, with an eye to where water puddles on a walkway. That’s where you’ll have a lake of ice in the winter, so fix the drainage. This is also the time to stock up on ice melt and a sturdy snow shovel. Once this is done, you can have a happy and warm fall and winter!